I've done a ton of digging but have been unable to find a solution to this problem. Specifically, I am creating a resume using the AltaCV class and multi column packages together. The goal is align two sections of the resume side by side if they are small sections such as skills, and hobbies. This is to make sure that I use all my available real estate. As you can tell the two sides are not aligned as I wish they were. 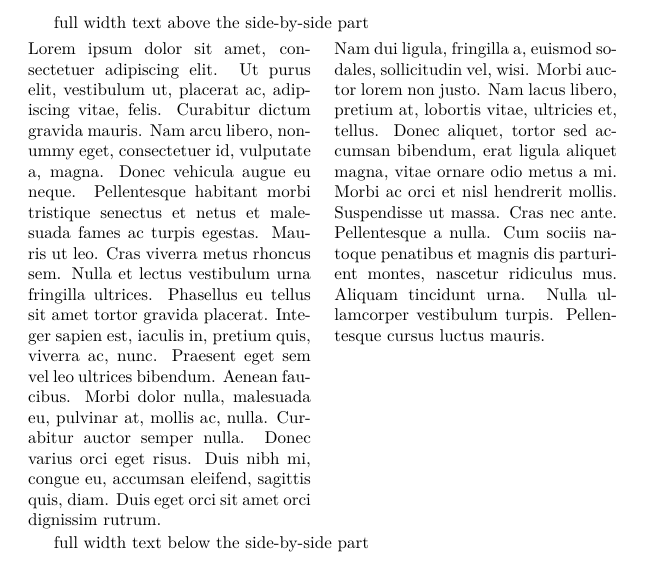 In other sections I make this work by carefully balancing both sides of the columns so that they align but this is very annoying and I feel defeats the original purpose of using Latex to begin with. Are there any ways to create two enviornments or blocks of text and code and then put them side by side as though they were figures? Move both \cvsection inside multicols environment. Delete extra curly braces around itemize environment. Use \columnbreak to manually breaking columns. Yes, you can use, for example, minipage environment to get a side-by-side effect. In the following example, the vertical space above and below the minipage is manually controlled. By the way, providing a MWE (minimum working example) is a better behavior than just providing snips of codes. Not the answer you're looking for? Browse other questions tagged horizontal-alignment environments resume or ask your own question. Displaying two XML listings side by side. How to move a phrase in a resume template? How can I left align my signature in a resume written in the res class? How to create a visual scale for resume? How to position two figures side by side with custom alignment? Deedy Resume; How to bold text?